2010 Citysearch® Best of Dallas TX contest. Y.O. Ranch Steakhouse chef-proprietor, Tony Street. What is the Best of Citysearch Dallas TX? Citysearch is the essential local guide for living bigger, better and smarter. Covering more than 75,000 locations nationwide, Citysearch combines in-the-know editorial recommendations, candid user comments and expert advice from local businesses to keep users connected to the most popular and undiscovered places wherever they are. Since 1996, the Y.O. 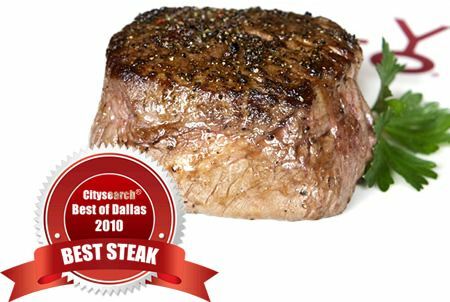 Ranch Steakhouse in Dallas has earned accolades for their exceptional steaks, outstanding service and inviting style. With an emphasis on using only the finest, freshest ingredients, the Y.O. is a Dallas favorite with both locals and visitors alike.Guests savor the finest cuts of steaks, wild game, chops and fresh fish cooked to perfection in a relaxed, elegant atmosphere that inspired the Food Network to declare the Y.O. Ranch Steakhouse as, “one of the nation’s finest steakhouses.”In addition to patio, bar and restaurant dining, the Y.O.’s private dining facilities can accommodate parties from 20-300 with the warmth and charm of a Texas lodge, elevating any private dining occasion to an extraordinary event.Experience the Best Steak in Dallas for yourself by calling 214-744-3287 or book online.